I had him on my preseason avoid list as one of the key members of the 2017 outlier club, as Andrus clubbed 20 homers during that juiced ball season while never eclipsing eight long balls in any of his other nine years in MLB. But the juiced ball is back with vengeance so far in 2019, helping Andrus off to his fast start in which he’s already knocked out three homers (while adding four steals). With the small sample caveat applied, Andrus has really changed to a more aggressive approach at the plate in the early going, trading walks and more strikeouts for career-highs (by a mile) in Hard Hit% (47.8) and exit velocity (92.8 mph). Andrus’ 27.3% HR/FB rate is sure to drop, but he also sports a .354 expected batting average that’s in the top 3% of the league, and having the ball juiced yet again while calling arguably the best hitter’s park this side of Coors Field home are huge helps as well. He’s hitting .357/.438/.732 with six homers and two steals, making Meadows a top-10 fantasy player over the season’s first two weeks. The 23 year old was a nice breakout candidate entering the year, but few could’ve seen this explosion. The former top-10 pick has shown good patience (12.5 BB%) while also sporting a .621 expected slugging percentage that’s in the top 8% of MLB, helping Tampa Bay get off to a surprisingly strong start that features the Rays leading baseball in run differential. One thing to point out with Meadows is that he has to play half his games in a tough pitcher’s park in Tropicana Field, and he has huge splits early on (1.435 OPS on the road compared to .786 at home). 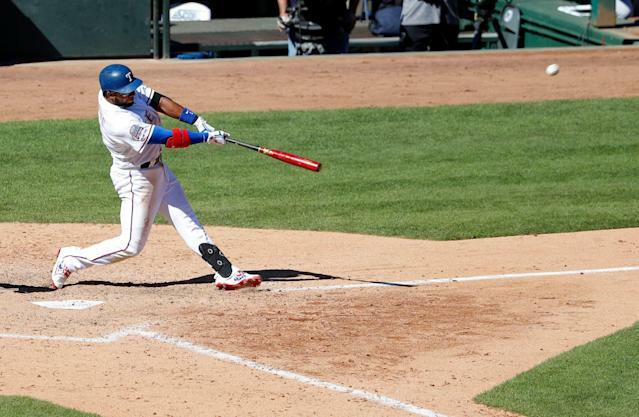 The 26-year-old has now decreased his K% each of the last two years while simultaneously increasing his Hard Hit%, launch angle and exit velocity over that span, with the latter (94.4 mph) putting him in the top 6% of the league. Hitting cleanup in Pittsburgh’s lineup (with OBP machine Adam Frazier in front of him), Bell is fully in line to deliver the best season of his career and reward fantasy owners with a big profit, as he didn’t cost much at draft tables. He entered his rookie campaign with modest expectations but has blown those away with an incredible start to his MLB career, when he’s been a top-15 fantasy player. His Statcast numbers more than back it up: He ranks in the top 6% of the league in exit velocity, Hard Hit% and xwOBA, while his Barrel% sits No. 3 in MLB behind only Mike Trout and Gary Sanchez. Obviously, Alonso isn’t this good (.433 BABIP), but it’s easy to be excited about owning him right now. His raw power is legit, evidenced by him producing one of the hardest hit homers (and hardest hit ball so far this season) since the advent of Statcast in 2015. Alonso’s future sure looks bright. He was a late signing in Cleveland during spring but hit well enough in the minors to now act as the team’s No. 3 hitter as soon as he was recalled Sunday. CarGo is 33 years old and outside of Coors Field now, but Progressive Field is another fine hitter’s park (especially for lefty power), and that’s a prime spot in the lineup hitting directly behind Jose Ramirez (assuming he wakes up). Gonzalez is more for deep leaguers, but he’s suddenly back to fantasy relevance. 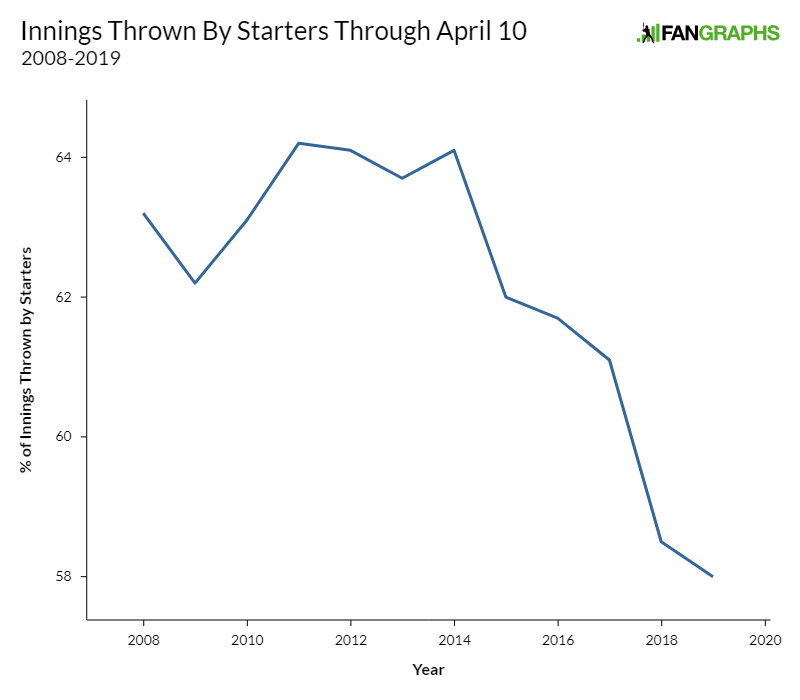 He’s off to a slow start (4.50 ERA, 1.75 WHIP, 4:3 K:BB ratio), but that’s not entirely unexpected after missing most of spring training while dealing with shoulder tightness. His arrow is pointing up, however, with news of Arodys Vizcaino hitting the 10-day IL with shoulder inflammation of his own. Assuming Minter’s healthy (his velocity is a bit down early on but still a strong 95.1 mph — more worrisome is his 14.9 career SwStr% is all the way down to 6.0), he’s plenty capable of sliding right into the Braves’ closer’s role and providing a bunch of fantasy value from here on out (Vizcaino’s long-term status remains cloudy). Cleveland’s two aces are off to horrendous starts, with Carrasco recently getting knocked out of the game in the first inning against the Royals, and Kluber having 10 walks and a 6.16 ERA on the year. Kluber walked 34 batters over 215.0 innings last season, and his average fastball velocity has dropped for the fifth straight year, currently sitting at a career-low 91.4 mph. Carrasco’s velocity is also down, and his SwStr% is his lowest since 2013. Cleveland fields an average defense, and it’s safe to expect both pitchers’ bloated hit rates to regress (Carrasco is sporting a comical .613 BABIP, with the second-highest being Nick Pivetta at a distant .447), but there are certainly signs that these slow starts might be more than just blips for these aging hurlers. Another pair of teammates who’ve conspired to destroy fantasy owners’ ratios and again coming from a team with extremely high expectations, Porcello and Eovaldi have combined to allow 33 runs over 26.1 innings. Unlike with Carrasco and Kluber, there are shallower fantasy leagues in which Porcello and Eovaldi are being dropped, and while I recommend staying patient with both pitchers, it’s certainly been a discouraging start (that might get worse before it gets better, with Eovaldi set to start in Yankee Stadium this week). I could talk about plenty of other pitchers who’ve seemingly seen their stock decline since the start of the season (Jacob deGrom has failed to record a quality start in back-to-back outings after setting the MLB record with 26 straight, while teammate Zack Wheeler has already allowed just one fewer run than he did all of last season after the All-Star break), as this trend just continues to grow. He’s off to a hideous start at the plate (.156/.278/.200 while still searching for his first homer), which wouldn’t be as worrisome if Milwaukee didn’t have a replacement ready in LHB Eric Thames, who would see the majority of starts if this ever developed into a full-blown platoon. Aguilar has actually cut his K% way down so far while also walking more, but his Hard Hit% has fallen precipitously from 42.6 last year to 32.4 this season. Aguilar’s struggles actually date back to last year after the All-Star break (.245/.324/.436), so there’s legitimate cause for concern with the 28 year old who didn’t breakout until later in his career.